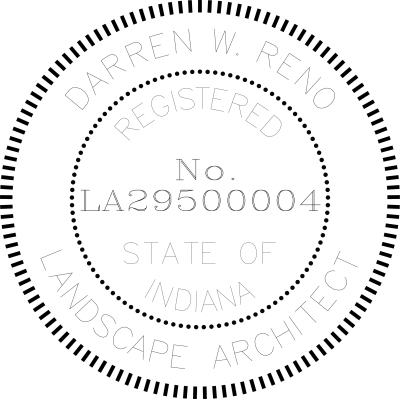 Founded in 2001, darren reno DESIGN provides full-service Landscape Architecture design and installation services. My 25 years of professional experience has instilled a philosophy of providing creative solutions combined with quality craftsmanship in order to provide a landscape that is livable, functional, ecologically sensitive, and aesthetically desirable while maximizing the financial return on the investment. Landscape Architect vs. Landscape Designer/Landscaper??? This is probably one of the most asked and misunderstood questions. Many people think they are the same, however there are significant differences between the two. Landscape Architect - Anyone practicing in the state of Indiana who carries the title Landscape Architect must first have a degree from an accredited university and pass the Indiana professional licensure exam which measures the educational standards as set forth by the American Socety of Landscape Architects and the State of Indiana. In addition, Landscape Architects in Indiana are required to obtain Continuing Education Units (CEU's) each year to maintain their licensure. Landscape Designer, Landscaper, etc. - Anyone (Including yourself!) can use these terms to describe the services they provide so there is no assurance of their actual qualifications. Grading and Drainage - Having issues with water infiltration? I can help!!! I cater my services to meet your needs from providing design and consulting services to project implementation. If you would like to schedule and appointment or if you have any questions, please contact me as I look forward to hearing from you! Copyright © All Rights Reserved. ​​​​​​​darren reno DESIGN, Inc.